Saw a reprint of rare George Herriman strips advertised on amazon.com, "Herriman's Hoomins". Date of publication was supposed to have been May 30 last year. Does anyone know whether this book is coming out at all? Us Husbands is a domestic comedy and its Sundays-only format allows for some of Herriman's richest and most detailed drawing — and it is by far the most obscure of Herriman's major works, with aficionados having seen only a glimpse of it. Stumble Inn, for which Herriman drew both richly detailed, six-panel dailies and glorious full-page Sundays, is sometimes described as a precursor to Fawlty Towers. It takes place entirely within a small hotel and pits the long-suffering proprietor, Uriah Stumble, and his staff against a rotating cast of difficult guests. Hijinx ensue, both verbal and visual. 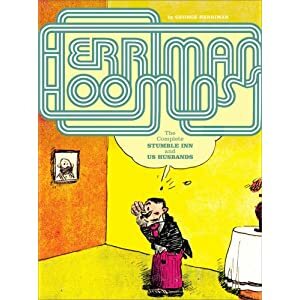 Herriman's Hoomins will be augmented with a historical appreciation by the invaluable Jeet Heer (co-editor of Frank King’s Walt & Skeezix reprint series and a critic for The National Post), and more Herriman rarities. George Herriman (1880-1944) was born in New Orleans, LA, in 1880 and died in 1944 in Los Angeles, CA. He is considered by many to be the greatest strip cartoonist of all time. I've now discovered that it was pulled from publication due to editorial changes, but that the material will be published in some form eventually.